Música compuesta y dirigida por Nigel Hess. 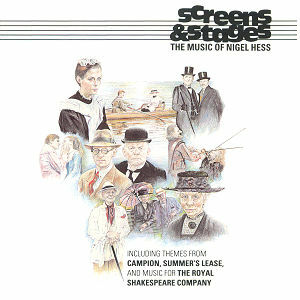 Interpretada por The London Film Orchestra. Músicos solistas destacados: Philip McCann (trompeta), Maurice Murphy (trompeta), Graham Ashton (trompeta), James Watson (trompeta), John Francis (violín), John Bradbury (violín), Julia Vohralik (violoncelo), David Firman (piano), Jeremy West (corneta), Nigel Hess (piano), Olive Simpson (voz), Christopher Lacey (gaita), Jane Lister (arpa) y Gareth Hulse (oboe). Grabada y mezclada por Toby Alington, Keith Grant, Tony Philpot y John Burns. Album producido por Nigel Hess. Miniserie dirigida por Don Sharp. Interpretada por Jenny Seagrove, Barry Bostwick, Deborah Kerr, Diane Baker, George Baker, Peter Chelsom, John Duttine, Peter Egan, Mick Ford, Christopher Gable, etc. Telefilm teatral dirigido por Terry Hands y Michael A. Simpson. Interpretado por Jimmy Gardner, Richard Clifford, Robert Clare, Philip Dennis, John Tramper, Geoffrey Freshwater, Alexandra Brook, Niall Padden, etc. Miniserie dirigida por Martyn Friend. Interpretada por Linsey Beauchamp, Katie Carey, Anna Cropper, Peter Davison, Emrys James, Edward Kelsey, Anton Lesser, Hilary Mason, etc. Miniserie dirigida por Martyn Friend. Interpretada por Harry Andrews, Geoffrey Bayldon, Faith Brook, Phyllis Calvert, Graham Crowden, Maurice Denham, John Franklyn-Robbins, Wendy Hiller, Hilary Mason, etc. Película dirigida por David Giles y Ronald Wilson. Interpretada por Kristoffer Tabori, Manning Redwood, Lou Hirsch, Erick Ray Evans, Carol Royle, Stuart Wilson, Paul Rogers, Peter Barkworth, Brenda Bruce, etc. Película dirigida por Diarmuid Lawrence y Michael Owen Morris. Interpretada por Eve Matheson, Rebecca Saire, James Saxon, David Swift, Gillian Raine, Benedict Taylor, Simon Dormandy, Freddie Jones, Jack Klaff, etc. Miniserie documental del Channel 4. Telefilm dirigido por Colin Luke. Interpretado por Stephen Dillane, Amanda Donohoe, Richard Hammatt, Anne Lambton, Trevor Ray, June Ellis, Hilary Mason, Christopher Downing, Owen Brenman, Kay Stonham, etc. Miniserie dirigida por Mike Vardy. Interpretada por Gillian Andrews, Tomek Bork, Chris Chering, Terry Coates, Kevin Corley, James Coyle, Stephen Dillane, David English, Paul Farla, Sarah-Jane Fenton, Elaine Ford, etc. Película dirigida por Martyn Friend. Interpretada por Gabrielle Anwar, Feodor Chaliapin Jr., Annette Crosbie, Susan Fleetwood, John Gielgud, Suzanne Hay, Jeremy Kemp, Rosemary Leach, Denis Lill, Mel Martin, etc. Serie dirigida por Robert Chetwyn, Ken Hannam, etc. Interpretada por Peter Davison, Brian Glover, Andrew Burt, etc.